Incumbent electricity and transport fuel producers lobby to hold back the adoption of renewable energy, but innovation has now eliminated the logic of their concerns. Coal-fired power stations met electricity demand during peak loads during the day and at night heated off-peak hot water systems and stored further energy in pumped hydro storage. The pumped-hydro storage system was available to supplement the coal-fired power generation capacity during the highest peak demand periods during each day. A large household in Australia uses up to 20 kilowatt-hours of electricity a day - about the same amount of energy that a 5 kilowatt rooftop solar photovoltaic (PV) can produce reliably on most days of the year. For reliable electricity supply, a household only needs to install enough battery storage to provide it with all the energy it needs for just one day. On most days, the solar PV system will recharge all the energy used from the battery storage, and the household can meet occasional peak loads by drawing energy from both its solar PV system and battery storage at the same time. 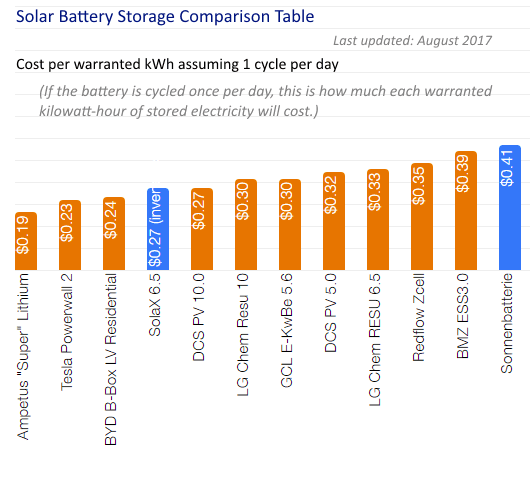 On days where solar PV energy output is below the usual level, the battery storage system can be topped-up overnight from large-scale generators. The large-scale generators can be informed of the total overnight demand well in advance - from data transmitted from battery storage systems, and schedule generation and distribution at times to make use of unused distribution capacity. This is like having supermarkets restocked by trucks using roads at 3 am in the morning to deliberately avoid busy peak-hour traffic. In periods of extreme day-time peak demands, the large-scale generators can be brought online to supplement the regular levels of demand that are met by solar PV and battery storage of homes, businesses and villages. This strategy eliminates the need for 'gold-plating' which is the major cause of high electricity prices in Australia: idle capacity for generation and distribution that is kept in reserve for as little as a few hundred hours each year when peak demand reaches unusual, extreme levels.